Description: To find the resources we need to build colonies in space, one place to turn is the Asteroid Belt between Mars and Jupiter. 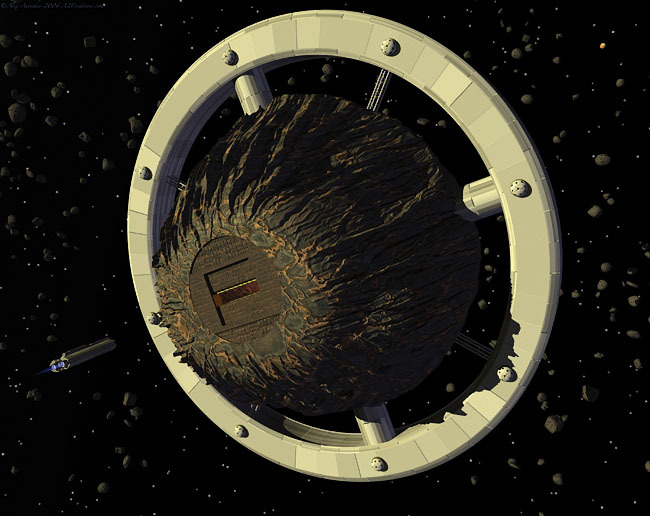 A large mining ship could pluck ore-laden asteroids from the belt, locking them in it’s grip while man and machine tunnel into it. Once hollowed out it can either be converted into a colony ship, or stripped completely and set adrift again. Rather than returning the precious metals to Earth, they could be used to create future offworld economies. Medium/Tools Used: “Asteroid Mining” was created using Bryce 6, with some props from daz3d.com. All my entries were made on a Mac G5.